Heya! New to the forum. 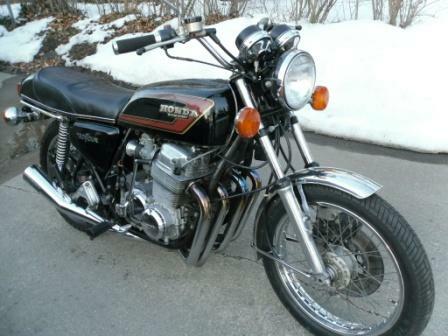 My son recently bought a ’76 CB750F Super Sport. As the pic shows, it was bought running velocity stacks. They have to go for a couple of reasons. One, no filtration. Two, the carbs are apparently still jetted for a stock intake since it runs too lean at speed. Good low rpm power, but sputters under load at speed. Choking it at speed makes it launch. I tried blocking half of the air flow on the stax with a strip of duct tape and that solves the lean fuel mix issue. Picked up a stock filter box. I know these things are usually kind of a jam-fit, but this one was nuts. There simply doesn’t seem to be enough room for the box. 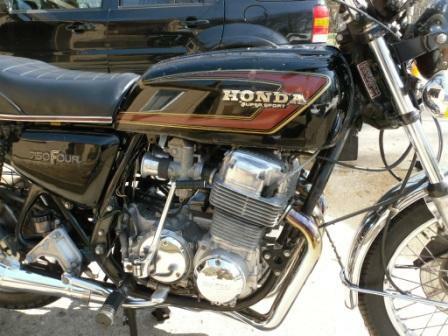 The carbs are Keihins, and differ from the K model carbs. The carb boots that connect the carb to the cylinder appear to be too long to provide enough room for the stock air filter box. Does anyone know if there exists a separate set of boots designed for the Keihin carbs? I was thinking about simply trying to shorten the collars, but there are some angles involved and I’m not sure simply removing some length from the straight sections will still allow the carbs to match up. Also thinking about buying some stock automotive hose and cutting some collars to fit. Not sure I can bend the hose correctly. I know I should just go with some K&Ns (or equiv) and rejet the carbs, but I’d rather use the stock air cleaner box because rejetting can be such a pain.